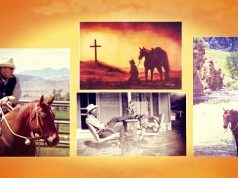 A truly incredible horsewoman, Sally Swift died on April 2, 2009, in her 96th year. Born Sarah Rodman Swift on April 20, 1913, Sally went from a quiet life in Vermont to becoming a world-renowned equestrian figure. For her contribution to the equestrian community Sally has been recognized by a number of organizations including the Lifetime Achievement Award from the American Riding Instructor Certification program in 1997 and induction into the United States Dressage Foundation’s Hall of Fame in 2006, an honor reserved for those persons who have had a major impact in the dressage community. In June of 2008, she was presented with the seventh annual Equine Industry Vision Award by Pfizer Animal Health and American Horse Publications, an award that recognizes innovation, ingenuity and service across the entire equine market. 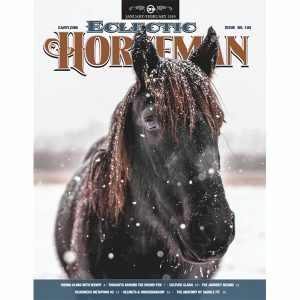 It wasn’t until her retirement from the Holstein Association in Brattleboro, VT (1975) at the age of 62 that Sally began what was to become known as Centered Riding and create the legacy she has now passed on to the horse world. Sally wanted to teach a few of her friends and travel a bit. 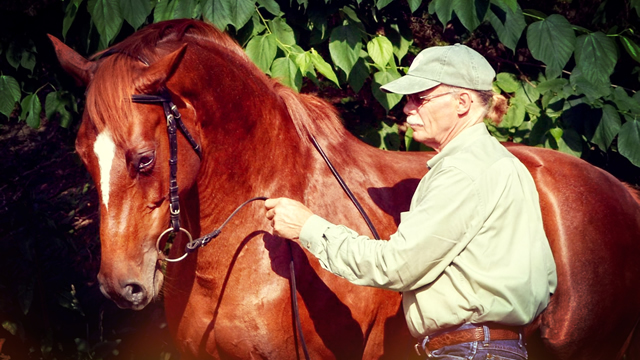 This little bit of teaching and traveling grew to untold numbers of students, trips to places as far away as Europe and Australia, training 11 apprentices, numerous instructors and writing two books, Centered Riding and Centered Riding II. Sally never intended to cause such a fuss in the horse world, it just seemed to happen. 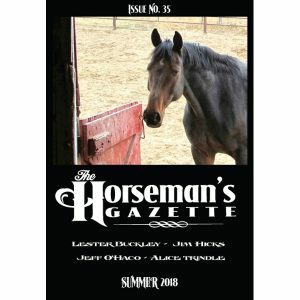 The catalyst for this phenomenon was the publication of her first book, Centered Riding, in 1985. Centered Riding has now been translated into 15 different languages and sold more than 800,000 copies worldwide. Sally’s book was so unique and such an inspiration at the time that people were prompted to contact her from all over the world. This was the case with her first apprentice, Richard Weis of Australia. Richard, upon reading Centered Riding, called Sally and by the time he got off the phone he was headed to the United States to learn from her. It is thanks to Richard that Sally started an apprenticeship program in which I had the opportunity to participate in 1992. However, the seeds for Centered Riding began long before in early childhood when Sally was diagnosed with scoliosis or curvature of the spine at the age of seven. Discovering that Sally had a scoliosis, Elizabeth Swift, Sally’s mother, asked the doctor if she could take Sally to see a woman named Mabel Ellsworth Todd, author of The Thinking Body. Miss Todd believed you could control parts of your body with your mind. The doctor thought it couldn’t hurt; therefore, Sally began her studies with Miss Todd, which lasted from childhood into Sally’s early 20s. After high school Sally pursued a career teaching riding ‘in the traditional manner’ but decided to go to college in 1943 because she did not want to become one of those “hard-boiled spinster” -riding instructors. 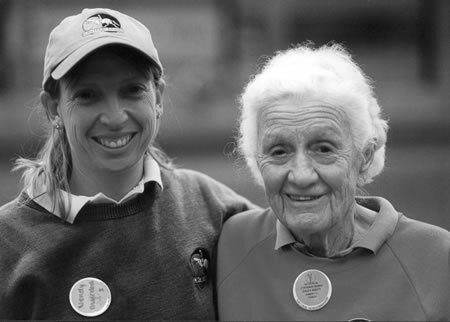 Graduating from Cornell in 1947 with a BS in Agriculture, Sally spent 21 years working for the Holstein Association of America located in Brattleboro, VT. Sally continued to be active in the horse world. She managed the Brattleboro Riding Club Horse Show, which grew to be the largest single day horse show in the United States. However Sally did not begin to explore the concepts Miss Todd taught her in relation to riding until her retirement. 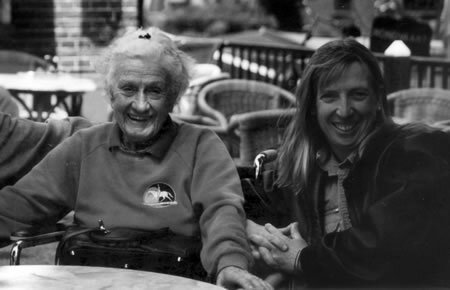 Sally Swift and Wendy Murdoch, in Holland, 1998. Miss Todd taught Sally how to move from her center, although she never called it that. In addition Miss Todd recommended that Sally learn to write with her left hand, have her sister, Agnes, carry her books to school for her and ride because it would be good for her back. Sally wanted to ride anyway so she was happy to receive this suggestion. It was the work of Miss Todd that Sally began to teach after retirement, which gradually evolved into “The Four Basics” of Centered Riding. As Sally continued to explore her ‘use of self’ in relation to riding and teaching, four primary concepts kept showing up: Soft Eyes, Breathing, Centering and Building Blocks. These became known as the Four Basics. Grounding was later added because it was determined to be just as significant and would be called the 5 Basic or the glue that binds the others together. These primary ideas form the basis of Centered Riding along with an understanding of human anatomy. As a teacher Sally was a master at imagery and recognized that many people learned through images and feelings rather than words. Her skill at combining different learning approaches in her teaching made her extremely successful in conveying her ideas to a wide variety of students. Instead of barking commands and yelling when the student was confused, Sally could always find an image or give the rider a feeling of what she was looking for. 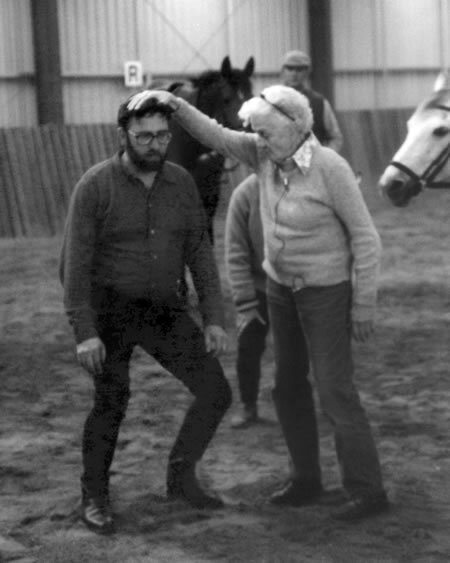 Sally’s kinder approach to teaching was also a significant contribution to the way riding instruction is now taught. 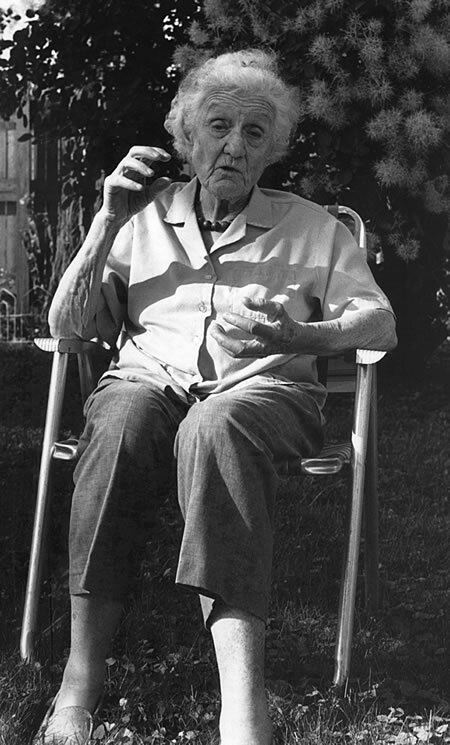 Sally was the consummate New Englander, frugal, dry with a good sense of humor and practical. I believe she wore the same pale blue piece of yarn for a hair band her entire life. “If it works just fine why change it?” Dressed in khaki pants, a polo shirt and Centered Riding sweatshirt or wool sweater, Sally wasn’t one for frippery. She never let her physical issues impede her. She always found a way to do something even if it meant changing the way she was doing it. At times Sally would come out to the arena on a cane or walker just so she could watch the lessons. Her mind was incredibly sharp even when her body wasn’t up to the task. Sally loved to teach. This more than anything is what seemed to keep her going. When she saw someone doing something and she thought she could help, she would have the rider stop. When she was younger she would go over to the horse, hold onto the saddle and touch the rider somewhere, perhaps in the middle of her back. You could see the energy and understanding flow through to the student. If she wasn’t stable enough to touch them, she would give them a wonderful image to think of as they rode around the arena again. I first met Sally in 1986 at a TTEAM Clinic. I was pulling on the horse’s tail and this little gray-haired woman commented on how it went all the way down the horse’s spine. This was Sally Swift. I took her instructor course in 1986 only 2 years after I fractured my left hip socket. My leg was still giving me difficulties both walking and riding. Sally touched my leg and changed my life. I can’t remember all the details of that clinic, only that I realized what this woman was doing was going to help me and it did in more ways than one. I pursued Sally’s teachings through a number of her instructors including Richard Weis in Australia. Coming back to the USA, I worked with Peggy Cummings, one of Sally’s first instructors. Then I began giving TTEAM clinics at Lucile Bump’s in Brattleboro. Sally would come to the clinics and watch me teach. It was then that I think she decided to take me on as an apprentice, but I would have to wait until after she had back surgery. In the spring of 1992 I traveled with Sally for 4 months. I was the last full-time apprentice she trained. Fortunately I lived in Connecticut, so I could drive home occasionally, but I spent many nights in her cozy little home where we would talk about the clinics, students and letters she received from all over the world. We traveled together to Michigan, Massachusetts, California and Oregon. I met many of her friends and students. They all had an unabiding love for this woman who had changed their lives in more ways than riding. During my apprenticeship it seems we spent a lot of time in the Chicago O’Hare airport. We would get a wheel chair so that Sally didn’t have to walk. This was after her back surgery, and while she was moving much better, she tired easily. I realized Sally wasn’t going to be able to live forever, so I took the opportunity to help Sally plan the future for her work. We would talk over a meal and I would ask Sally what she wanted Centered Riding to look like when ‘she was no longer around’. . I took notes. This eventually became the basis for Centered Riding, Inc. the organization that continues to keep the principles of Centered Riding going. That was 17 years ago and those notes continue to form the basis for Centered Riding, Inc. today. Sally and I had wonderful conversations in her home. I would come up to Brattleboro, sometimes staying overnight in her spare room. She was independent even when she needed a little help. There was a trampoline and a treadmill in her living room. She kept herself moving and had regular body work including cranial sacral therapy and acupuncture. Never one to be down or blue, Sally always had a positive attitude, eager to hear of new ideas and willing to try something different. We would sit in the kitchen drinking a cup of tea at the tiny kitchen table covered with magazines and letters. Sally would light up like a firecracker when she received a letter from someone telling her how much they benefited from her book or a lesson. Sally would read a letter with a smile that lit up the room. This is what kept her going – seeing others be successful in their riding, happy in their relationship with their horse and in their life. Sally shaped the lives of many people. There is no way to count how far-reaching her work is or how many people she has influenced through her simple, clear ideas and the importance of including ‘self’ in the picture. In 1997 Denny Emerson spoke to the Centered Riding® Annual Conference. Denny had been instrumental in encouraging Sally to explore her ideas about teaching with focus on the rider. She would give lessons at his farm in the 70s and 80s prior to the publication of her book. Denny’s short but extremely powerful speech in many ways summed up what Sally brought to the horse world through the concepts she developed into Centered Riding. Although, while he was speaking to the group, keep in mind that Centered Riding is what Sally Swift created and therefore it is she that developed the system he refers to in each point. 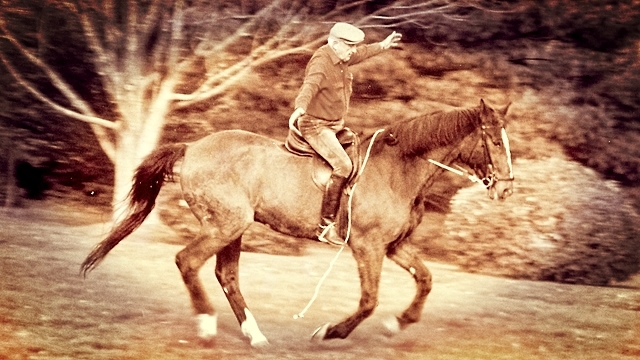 “Centered Riding has a mission – probably a number of missions – and it is by clearly articulating the missions that the powers Winston Churchill speaks of can do a lot of good for a lot of riders and by extension, for a lot of horses. “I’m not a Centered Riding teacher, per se, but I’ve been around Sally Swift for enough years to know a lot of the things that I think Centered Riding has to offer the American riding public. “1. An awareness of how the human body, which is a vertical body, can best interact with the essentially horizontal body of the horse – this meshing of the two systems is not very perfect in most cases. Centered Riding explains how that mesh can be brought about. A good seat meshes the vertical body of the rider with the horizontal body of the horse to give a good picture. In the old days, the cavalry method taught riding by lunging you for 6-8 months on 4-5 horses per day. Lots of people washed out. The ones that could take it became good riders. 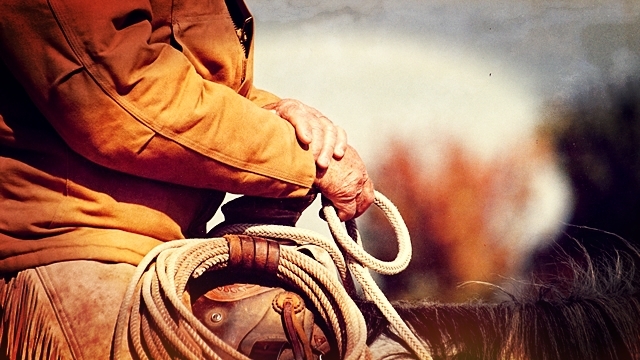 The horses bludgeoned the rider’s body and the instructor bludgeoned their mind. At the end the riders could sit on the back of a horse and all the muscle groups meshed with the horse. These instructors only knew how to teach riding with this system, which was inaccessible to the average rider. 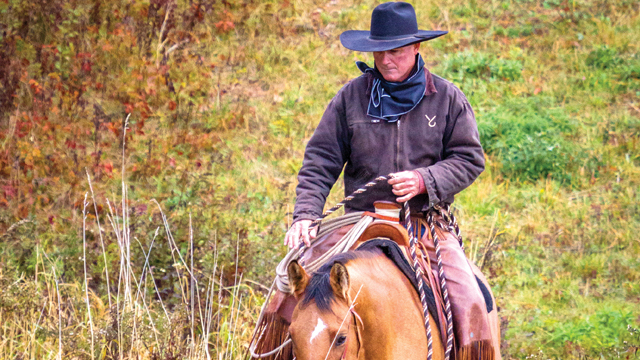 Centered Riding explains how to shortcut this process through understanding. These folks did not understand the mechanics – Centered Riding does. “2. A sense of obligation on the part of the rider to the horse. Many systems of riding ignore this – that when you thump you are causing pain and discomfort to the horse. So a tenet of Centered Riding is that when you mesh you are a better and more humane rider. If you are able to do these Centered Riding things then there is an automatic lessening of pain to the horse. Also, we as Centered Riding instructors are coaches as well as teachers. Physical fitness needs to be stressed. Fit people are more agile. This is not about body type or weight but about fitness, being an athlete. And while you may be too scared, unfit or insecure, you are not too old. I have a 74-year-old student doing Preliminary level eventing. So this sense of obligation to the horse is important. “3. Centered Riding is a gift. When it starts to work what I see is a sense of heightened self-esteem on the part of the rider. There is no lower posture than the fetal position as a sign of insecurity. The fetal position is the antithesis of self-esteem. Centered Riding opens you up in all directions. When you do that, it is the antithesis of low self-esteem. This is an unspoken tenet of Centered Riding. When you get through to people in that way (like the Indian in the book) energy flows up and out not down and in. “4. All these things pale in comparison to the exuberance and joy that Sally Swift brings to her teaching. That is what we all have to learn from Sally. Of all the legacies of Sally, all the systems, the specifics, never forget that what has made Centered Riding grow outward and beyond just Sally, is the exuberance and joy which springs from expanding limits – usually self limits. What Centered Riding has to give is a huge amount of material not given by most systems. It is this last point that I think is the most important. It is the joy Sally brought to her teaching, her students and instructors that was the essence of Sally. I once met someone who watched me teach. While I was not teaching Centered Riding per se the woman came up to me afterward and said to me that she could see Sally in my teaching. It was the enthusiasm that she was referring to. Sally taught because she loved teaching. She cared about the people whom she taught and was so excited to see someone else understand what she was getting at. She loved the horses, too and when a horse changed because a rider finally let go, she would point it out with a thrill. Sally validated the thoughts and feelings of all those who knew there had to be a better way to ride but didn’t know how to find it. 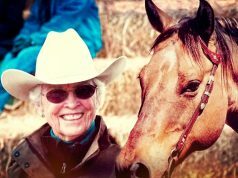 Sally created the path, shone the light and handed out the tools for riders all over the world to achieve the relationship they were searching for with their horses. In return the outpouring of gratitude, relief and joy from her students kept Sally going. Sally’s gift to the horse world cannot be measured in any known standard. Her legacy lives on in anyone who thinks about how their body affects their horse and how they can make it better for the horse by “good use of self.” For this there is no measure. Previous articleTo Spur or Not to Spur?